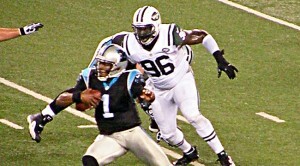 Cam Newton will start for eXpertLeagues.com’s Randy Dean, but RG3 will be breathing down his neck. This league basically follows the basic ESPN PPR league rules and scoring system. With 10 teams and only two WRs in the starting lineup, it’s definitely a shallow league. Randy Dean drafted the eXpertLeagues team, so let’s take a closer look at it. He had the second pick, so Jamaal Charles was an obvious choice there. He followed that with picks of Giovani Bernard, Alshon Jeffrey, Rob Gronkowski, Rashad Jennings, and Percy Harvin, before taking Cam Newton as his starting QB. A shallow PPR league is a perfect format in which to take a chance on Gronk. If he misses time, it’s easier enough to fill in with a waiver wire tight end. Martellus Bennett, Charles Clay, Delanie Walker, and Ladarius Green weren’t even drafted. It’s also a good format in which to wait for QBs. Randy grabbed a nice duo of Cam Newton and Robert Griffin III late. Randy rostered elite options at K and DST (Stephen Gostkowski and the Seahawks), which is also a good idea in a shallow 10-team league. I like taking Dexter McCluster late in a PPR league, as he could pretty much be Danny Woodhead but several rounds later. Click through the following links for DRAFT RESULTS (BY ROUND), DRAFT (BY TEAM), ROSTERS, and STANDINGS on the actual league site.